Hi! My name is Erica Zimmelman and I am the hostess and chef at Taste, a Personal Chef Service. I've been cooking and baking for as long as I can remember. As a little girl my mother and I would bake dozens of different holiday cookies that were famous with family and friends. Later, as a budding "foodie" living in New York City I explored cuisines beyond my own culture, took classes at the Institute of Culinary Education, and came home to recreate my food finds for family and friends. Today, I am a proud member of the United States Personal Chef Association. Taste represents my personal approach towards feeding my family, and one that I look forward to sharing with yours. My cooking is fresh, seasonal, and always exciting. A typical week in my home includes the familiar, such as my Grandmother's Lasagna (including my family's "secret" ingredients), and the exotic, like Thai Seafood Curry. Before I was a personal chef I had a successful career in marketing and market research. I know what it is like to be busy professional - juggling a family, personal commitments, and a career can be difficult. Many of us can often be heard saying, "If only there were more hours in the day..." I can help you maintain a healthy balance and take back valuable time - saving you as much as 10 hours a week in food shopping, preparation, and clean-up. 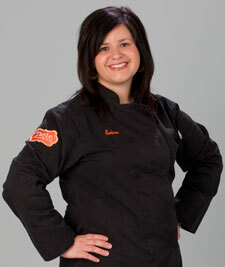 I am excited to share my passion for great food with you and your family! TASTE is a truly wonderful service. As a working Mom with a demanding career, it is an incredible relief to come home each night to home cooked meals ready to heat and serve. My family certainly appreciates the extra time we get to spend together and decreased stress level as a result. Chef Erica offers an excellent and diverse menu spanning across traditional American to Italian, Mexican, and Asian cuisine. Each meal is prepared specifically to meet the preference of my family, which is very important for us as we tend to eat a lot of veggies and legumes with a variety of spices. TASTE takes great care in developing and fine-tuning meal plans for us. We also like to travel frequently, and coming home to a fridge stocked with fresh food and prepared meals is the biggest relief I can ever ask for! I used to dread getting home from our travels knowing I had to make that first dreaded trip to the grocery store and struggle to cook all week, but now I actually look forward to getting home and having a delicious meal that very night! Overall, TASTE has helped take a major burden off our shoulders in our daily lives while expanding the variety of foods we eat. What a fabulous gift my daughter gave me! A personal chef just like Oprah has! Never having an experience like this before, I felt somewhat apprehensive about having someone cooking in my home, but what an amazing experience it turned out to be. When I arrived home that evening, I was delighted by the intoxicating aroma of Erica's magic. Then, the individual sized gourmet meals stood like little soldiers in my fridge and freezer calling me to feast. I couldn't wait to try one of my healthy dinners. The food was superb, beyond my expectations! And the kitchen was spotless. I'm hooked! As many of us have full schedules, it is often difficult even impossible to eat healthy. Erica has provided me with a stress free alternative to fast food or ho hum meals. As a young newlywed, I found myself completely overwhelmed when it came to cooking in general. I was invited to a "Taste" cooking demonstration and assumed that I was in way over my head. Erica was a breath of fresh air. She was so welcoming and understanding of my novice cooking skills, and took the time to make sure I understood everything. Not to mention the food was absolutely delicious! Her knowledge of food, its uses, and its nutritional value is prominent and she actually got me excited about getting into the kitchen. I would highly recommend her to everyone I know. I was thrilled with your courtesy and service…the meals were well prepared and you left the kitchen spotless (you even did the dishes I left in the sink!). Thank you again for being the hit of the party. Everything was perfect! Just wanted to let you know that everything was just fantastic for our holiday dinner. I can't wait for the next opportunity to do it again. I wanted to let you know that the food was absolutely PERFECT! Everyone RAVED about the appetizers, they went like wildfire. There was nothing left - it was all delicious!!!!!! I just wanted to thank you for the wonderful job you did. My daughter and I are overwhelmed by all the good food we have to eat. I can't seem to find a restaurant that serves good meals. Your service was better than any restaurant we could have visited and right in our own home! We are going to be using your service again and I've already raved to others about Taste! Once again, thank you! We are extremely happy with the meals you have prepared for us. I am so thankful that I found your website on the Internet. Everything is so delicious and definitely has a positive impact on my health. Just wanted to send a quick note that I LOVE LOVE LOVE your side dishes. I can just sit with a bowl of your traditional stuffing and eat it (and did). I served a pork tenderloin along with your sweet potato casserole and also the cheesy scalloped potatoes. AND I loved both of them. My kids said "I don't like sweet potatoes" and guess what two of them ate? YOU made my night. I really like having the side dishes already made so I can just cook/grill the entree and the rest I just pull out of the freezer and bake in the oven. I just wanted to thank you again for the wonderful catering job you did. All the food was absolutely delicious! I loved feeling like a "lady", being able to entertain my guests -- you helped make this happen for me. We were thrilled with how everything turned out, thank you again for everything! Thank you for your most delicious tea sandwiches, everyone loved them! We were very impressed with your composure throughout the event, what a professional! You did a fantastic job! I wanted to thank you for catering my daughter's First Communion lunch. The food was a hit with everyone! We all enjoyed our time with family and friends not having to tend to cooking the meal. You were wonderful to work with and I hope we'll get the chance to work together again. Thanks for leaving the kitchen spotless. Thank you so much for the amazing dinner last night. You far exceeded our expectations! Everything is Great!! The portion sizes are perfect and heating was easy as well. I am very happy I finally made this decision!! Erica, we are so happy. I just ate the best crabcake of my LIFE. My kids love your banana bread, and the potatoes you made...Needless to say, we can't wait for you to come back. We're your newest fan club!